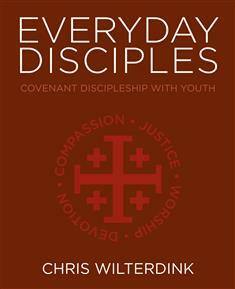 This resource is designed as a supplement to Everyday Disciples: Covenant Discipleship with Youth. This piece explores the value and need for confidentiality as a part of covenant discipleship groups with youth, as well as suggestions for actions when confidentiality must be broken. Covenant Discipleship groups work best when trust is built within the group. Because the ideal groups meet weekly, remain in regular communication, and encourage accountability, the ability to keep confidence with one another builds trust. In fact, some adult Covenant Discipleship groups, the group will make a confidentiality agreement where participants agree to not repeat anything they say or hear during a group meeting. Covenant disciples should make every effort to build trust with each other. Trust will encourage a deeper level of sharing and honesty in a group. Keeping confidence with each other is especially important because there are so many places to share information and be in conversation. Why is Confidentiality with Youth Different than with Adults? Trust is equally important with youth and adult participants in covenant discipleship. That said, those under the age of 18 in the United States are not considered as legal adults, Therefore, an adult (who is considered by their age to be in a place of greater power and responsibility) must be aware of certain situations where confidence must be broken. Youth under the age of 18 are considered minors in the US, therefore and adult who is 18 or older in a covenant discipleship group must both build trust with youth as well as make it clear that certain types of behavior or thoughts require sharing outside of the group. When does an Adult Need to Break Confidence? Covenant Discipleship groups are groups built to encourage spiritual development through mutual accountability. That means all members of a group agree to the same ground rules in their group covenant. The guide can be a youth or adult member of the group, and that guide should be the one to state, from the beginning, what kinds of things would constitute the need to share information outside of the covenant group. A guide, whether an adult or youth, involved in a covenant discipleship group should never share information from within the group with youth outside the group. For more in depth information about what requires sharing, refer to your local church’s or Annual Conference’s Safe Sanctuaries Policy. General Information on Safe Sanctuaries can be found at www.umcdiscipleship.org/leadership-resources/safe-sanctuaries. In cases of borderline behavior, consult with your pastor. They also honor the abuse prevention and risk reduction tools covered in Safe Sanctuaries, and would be familiar with local regulations. How do I Minimize Damage to the Trust if I Need to Share Information? Let the youth know ahead of time that you need to share information with another adult. Also share what you plan to say. Let the youth know what you’d specifically like to share, with who, and why. Something like “Do you mind if I talk with your parent(s) about ____?” Document the youth’s permission. When a youth joins a covenant discipleship group, assure the parents in writing, or otherwise, that you will let them know if their youth is in harm’s way. Consider including something like this in a clause when the group writes their covenant. Invite the youth to use their own words when they share with another adult, with you present. Additionally, invite the youth to be present when you are sharing, so that they know what exactly is shared. If not already included in any medical or parental release forms, consider creating a document to be signed by the class leader (guide), parent, and youth that outlines when the group leader may need to share information from within the group including: Harm to self or others, Abuse or neglect, or a court or legal proceedings. Sign and date the agreement along with the group covenant. The concept of confidentiality agreed upon in the group should extend to social media as well. Social media can be a valuable tool for covenant discipleship groups for youth, providing an additional space to check-in, and provide an additional layer of accountability. A conversation with participants about what is and is not appropriate to share on social media is very valuable at the beginning of a covenant discipleship group with youth. Make sure to create clear parameters about what kinds of things can be shared publicly, versus those that should be held in trust. Apply the same considerations listed on the previous page regarding the sharing of information virtually. Always attempt to connect with their parent or guardian as well. This will facilitate your sharing of information if necessary. Avoid private messaging when possible, use group chats. Keep written records of any messages shared back and forth. Most platforms do this automatically for you. Everyday Disciples: Covenant Discipleship With Youth by Chris Wilterdink resources pastors, youth leaders, and youth groups with information and planning materials related to Covenant Discipleship and accountability practices. Covenant Discipleship encourages youth to connect with Christ and one another through mutual accountability. It also encourages a networked support structure for living in the world as Christ followers. The resources on this page are designed for use with Growing Everyday Disciples-Covenant Discipleship with Youth by Chris Wilterdink. For more information on this resource, please visit the Upper Room Bookstore.